Valve's Gabe Newell has hinted that the gaming giant will consider developing and selling its own hardware if it is the only way to innovate. Valve's success with high-profile games and its Steam delivery system has been a big part in keeping PC gaming buoyant, but Newell appears frustrated with the lack of progress being made in hardware. Speaking to Penny-Arcade, Newell confessed that the thought of making the kit that the company's games are played on has occurred. "Well, if we have to sell hardware we will," he said. "We have no reason to believe we're any good at it, it's more we think that we need to continue to have innovation and if the only way to get these kind of projects started is by us going and developing and selling the hardware directly then that's what we'll do. "It's definitely not the first thought that crosses our mind; we'd rather hardware people that are good at manufacturing and distributing hardware do that. "We think it's important enough that if that's what we end up having to do then that's what we end up having to do." There are only a handful of gaming companies that could even allude to making hardware – but Valve is certainly among that group. 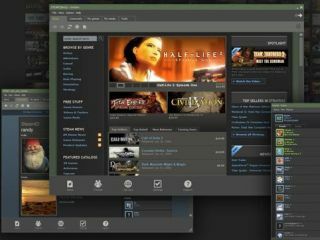 The prospect of Valve hardware appears remains small, but it's clear that a company that has kept the PC going as a gaming platform is keen not to get stuck behind ageing tech.